One of the greatest high points of an academic's career is when they are awarded a chair in recognition of their work. Today Ian Bogost brought it to our attention that our own Jesper Juul already has a chair  at IKEA. On first blush it looks like those ill-fated ergonomic chairs of the 1980s, but it's really just a bench at two heights. The user is meant to straddle the lower height and use the upper to rest his arms while holding a videogame controller, avoiding the strenuous and annoying work of holding up his own arms. 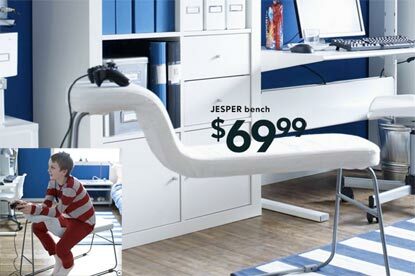 Even more remarkable is the seat's name: Jesper. No matter the commonality of this forename, surely we can only conclude that this product represents the Swedish company's attempt to take advantage of fellow scandinavian and well-known games researcher Jesper Juul. The difference between him and his namesake bench? Juul can hold his own arms up while playing videogames. We're going to have to pick up a couple for the lab. One can never have too many Jespers, after all. Anyone interested in their very own signed Jesper (the bench, not the ludologist) can ping the good Dr. Juul via his blog or his website.